A crown lengthening procedure is minor dental surgery which is performed to expose additional tooth structure above the gum line. 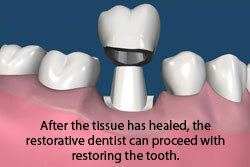 Crown lengthening is performed for restorative and aesthetic purposes. Crown lengthening requires that the gum and the bone beneath the gum be reduced to change the gum-to-tooth ratio, thus improving your smile and the amount of tooth available for restorative dentistry. 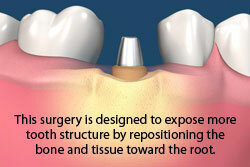 Most crown lengthening procedures are minimally invasive and there is little post-operative discomfort. Crown lengthening for restorative purposes is required when there is inadequate tooth structure available to place a crown or other type of restoration. For example, if a tooth is fractured off below the gum line or has severe decay, the remaining tooth structure may be too short to anchor a restoration successfully. 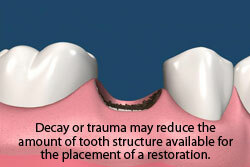 Crown lengthening exposes additional tooth structure so that restorations can be placed onto a more stable base. 80% of all patients over 65 have some form of periodontal disease? Scaling and root planning, a deep cleaning, is one of the most effective ways to treat gum disease before it becomes too sever. © 2019 Periodontics & Implant Dentistry Center, LLC. All rights reserved.